i MAY HAVE CLOSE TO 200 HOURS ON THE PLAYER AND THINGS HAVE REALLY IMPROVED IN ONE MAJOR WAY. The sound stage has opened up considerably. You talk about wall to wall sound. I had noticed I was needing to dial in to get the center image to spot on to much. So I had looked carefully at the way my Parker Sig. 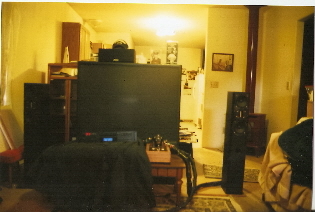 95's were positioned and realized I needed to bring out my right speaker another atleast 1 foot closer to my other long wall and WOW WOW, Now I can hear a solid front image and the sound has expanded in all directions and this player is floating my boat with unbeleivable sound stage imaginig. I feel that this has been the most improved componenet I have ever had. Thanks Steve for a job WELL DONE INDEED. Glad to hear your enjoying it! With my BLH's, the speakers do a complete disappearing act. Soundstaging/imaging is certainly one of the ZCD's strengths! I am getting a mind blowing soundstage and the focus and palpability of images is a little scary at times. I'm sure that some of this is due to the ZCD and some is due to the speakers. If you ever decide that you could use a bit more in the "bottom end", my plate amp powered Hawthorne Augies are working out very well. REL subwoofer. This is going to be expensive maybe 2K or more,But I have heard this sub. 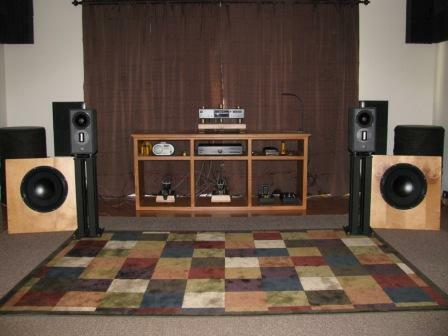 at RMAF a few years back with small dynamic speakers interfaced with and the bass slam and headroom was unreal. This is the only major upgrade I need for my system to get that last bit of fre q. response from 16 hz to maybe 80hz or so. I thought I should try to finally post 2 photos of my system. 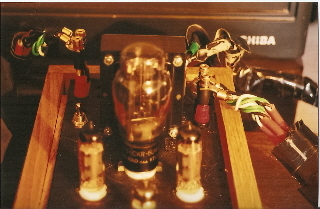 Here is one photo up close of my DIY 84C AMP.Notice this is not a stock amp. I DID THIS FROM KIT, and u can see my monsterous speaker cable as well.